Bob Pastorella has just posted a nice, in-depth review of Autumn Cthulhu, edited by Mike Davis and published by Lovecraft eZine Press, at This is Horror. Bob singles out four stories for mention: “The Night is a Sea” by Scott Thomas, “Memories of the Fall” by Pete Rawlik, “Andy Kaufman Creeping Through the Trees” by Laird Barron and my own “The Smoke Lodge.” Thanks for the great review! I myself found Autumn Cthulhu to be a most worthwhile read, full of enjoyable and varied approaches to the subject. I hope more readers will check out the book. Not long ago, Des Lewis finished one of his real-time reviews of my collection The Lure of Devouring Light — you can see where I talked about that HERE. Now Des is in the middle of a real-time review of Autumn Cthulhu, the cosmic horror recently published by Lovecraft eZine Press. Scroll down to the comments at the bottom HERE, where each comment discusses one of the stories. As I post this, he’s about halfway through the book, and hasn’t yet reached my favorite, “Anchor” by John Langan. He did seem to like my story “The Smoke Lodge,” which is nice to see. Today is the official release date of the Autumn Cthulhu anthology. The paperback and Kindle versions are both available from Amazon HERE. Note that there’s a “Matchbook” deal so if you buy the paperback first, you can then buy the Kindle version for the reduced price of $1.99. I had a chance to see a proof copy last weekend at H.P. Lovecraft Film Festival in San Pedro, and it looked great. See? I can’t wait to receive my own copy to keep! Great job to Mike Davis, and everyone who helped Mike and Lovecraft eZine Press put this one together. That’s a hell of a roster of writers. I’m very proud to have a spot in this book. 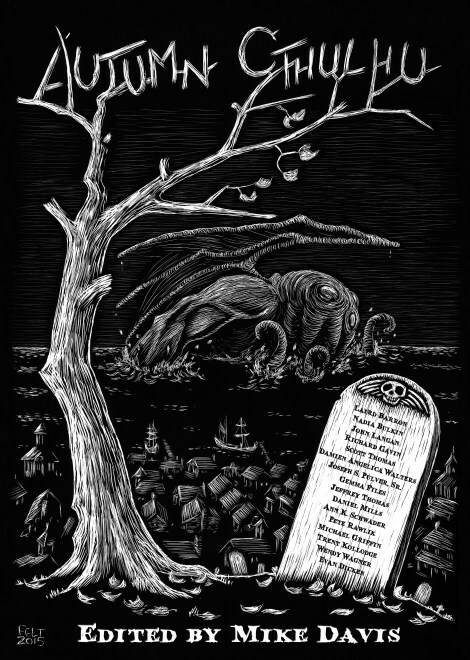 Editor and Publisher Mike Davis of Lovecraft eZine has announced that the much-anticipated, long-awaited anthology AUTUMN CTHULHU will be released in April. Because this was a successful Kickstarter, the first 563 would-be readers have already purchased their copy, but if you didn’t pledge the fundraiser and want a copy, you should be able to pre-order soon. And because Mike will be in San Pedro for the H.P. Lovecraft Film Festival April 29 through May 1, I’m guessing copies of the book will be available there (where you could get signatures from a few of the writers with stories in the book) if not sooner. Can’t wait! Trick or the Other Thing – Joseph S. Pulver, Sr. I can’t wait to see the finished product, and to check out everyone’s stories. Congratulations to Mike Davis for putting together a great book and a successful fundraiser, and also thanks for letting me be part of it. The Kickstarter for the upcoming Autumn Cthulhu anthology from Lovecraft eZine Press has been a success, having reached the initial goal of $8,000 within four days. The Kickstarter has gone on to reach the $13,000 stretch goal to include a story by S.P. Miskowski, and most recently the $16,000 stretch goal to include a Robert Levy story. The third and final stretch goal of $19,000, if met, will result in the inclusion of a story by Orrin Grey. I respect and enjoy the work of all three writers, and really hope the book may be expanded to include all of them. Of course with two or three new writers/stories included, this sequence will likely change, unless the new additions are just stuck at the end (or beginning), which seems unlikely. One of the books I’ve been really looking forward to this year is AUTUMN CTHULHU, edited by Mike Davis and to be published by Mike’s Lovecraft eZine Press. I’m excited about it because I really like my story “The Smoke Lodge” and look forward to getting it out into the world, and also because it’s fun to appear in a book alongside many of my favorite writers. There’s not an exact release date yet, nor final cover art, but Mike Davis has released the final Table of Contents along with this very appealing piece of promotional art by Dave Felton (not the actual book cover). This looks to be a great mix of established superstars of weird/horror fiction, and newer or emerging writers. I can’t wait to get my hands on a copy and check it out!